Eco-friendly round recycled plastic 32 gallon receptacles ready to facilitate attractive, litter-free atmospheres. 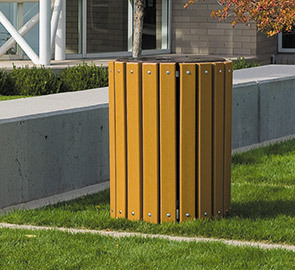 Engineered to withstand heavy use, these receptacles are ideal for recreational areas, commercial locations and other high-traffic sites. 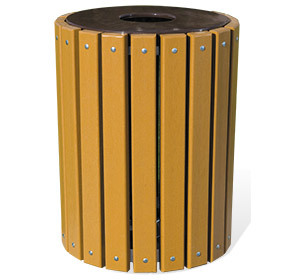 2" x 4" slats are developed from 96% commingled post-consumer recycled plastic materials. Slats are bolted to 3/6" x 2" flat upper and lower frame rings and tied together with a precision punched 12-gauge steel bottom plate—all MIG welded for top durability. These virtually maintenance free receptacles are an economical choice great for a variety of indoor or outdoor settings. Zinc hardware comes standard and lid options, liner and mounting kits sold separately.